Just in time for the Christmas shopping season, the band known just as much for their marketing as their music is back with a new 2 disc DVD set. KISS – Rock the Nation Live is one of the best live KISS DVDs out there. 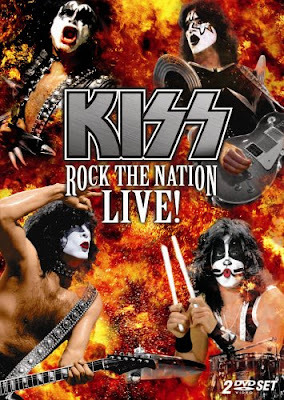 Unlike most of their other home video releases, Rock the Nation Live is an (almost) complete KISS concert. Some of the between song banter has been cut, but the majority of it is there. We even get Paul Stanley’s incredibly moving speech denouncing terrorism and his impassioned proclamations that the United States is the greatest country ever. Of course, what really stands out on this collection is the song selection. Lost gems like “Got to Choose,” “Tears are Falling,” “Makin’ Love,” and “Love Her All I Can” are all performed in addition to the tried and true. Interspersed throughout the concert are backstage moments that let you see what its like off the stage. It’s great to see the band briefly trying to run through “The Oath” and “Mr. Speed” at sound check. The sound on the disc is great. This one is about as close to an actual KISS show as you’re going to get. There are very few overdubs and it all sounds live. They even left in Gene Simmons’ massacre of the lyrics to “I Love it Loud.” The only time that something is noticeable is during “Parasite.” I could have sworn that I heard a backing vocal during the verse. However, no one other than Simmons is singing. There aren’t many special features on this disc, but the ones that are here are interesting. The KISS Powervision/Select-A-Kiss option is great. It lets you choose which member of the band you want to watch. I found it most fun to watch drummer Eric Singer. Forget Peter Criss, Singer takes over the Catman character and plays with an intensity that Criss hasn’t been able to pull off in 20 years. There’s also the bonus theatre performance of “Goin’ Blind” and some horrible sounding backstage rehearsal footage that’s fascinating to watch. Truth told, KISS Rock the Nation Live may be the best KISS DVD out there. If you attended the band’s 2004 tour and want to relive it, this is the only way. Long time fans will get a kick out of the obscure tracks like “Love Her All I Can” and new fans will be happy to sing along with “God Gave Rock and Roll To You II” just one more time. So put this in your favorite KISS fan’s stocking this year and wish them a very merry KISSmas.